Writing a photography proposal is a learned process. I still learn something new every time I need to write one. Everyone has a slightly different way of doing things, so you have to figure out what works best for you. Writing an estimate is essential for large advertising jobs. Editorial jobs for magazines and newspapers often approach you with a predetermined budget. 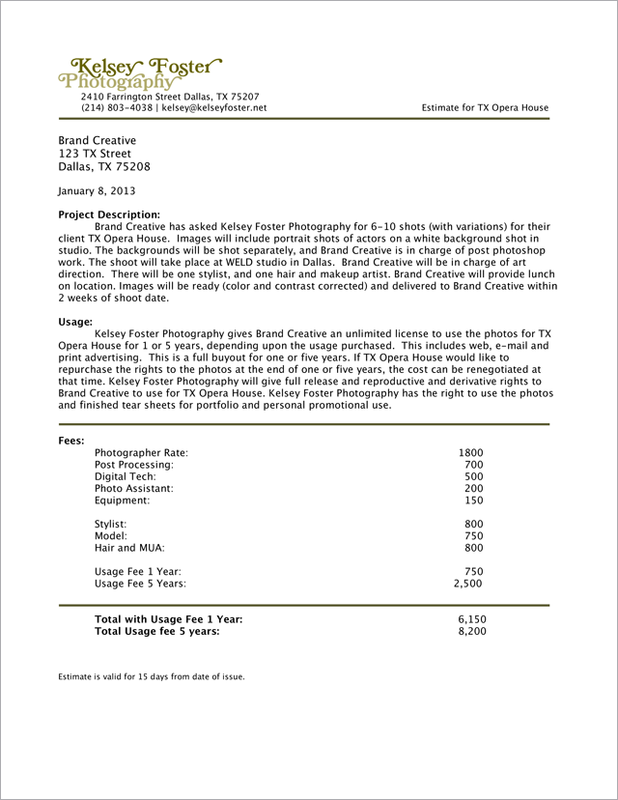 Wedding and portrait photographers often structure their form and fees differently. No matter what type of photographer you are, being able to appropriately charge for your time and expertise is essential. These tips will help you think about what, and how much, to charge a prospective client. I try to keep everything simple by dividing my estimates into three sections: project description, usage rights, and fees. Here is my proposal writing process. When/where will the shoot take place? If needed, who will retouch? What is the deadline for the finished photos? Then I take this information and write a brief project description, so everyone involved in the project is on the same page. This also protects you from getting asked by the client to shoot more shots than you originally agreed to, etc. The second section is about usage rights for the images. Be sure to ask the client where the photos will be used. Will they be used on the web only? Print? A national billboard ad campaign? Obviously, the usage fee should be higher if it’s a national ad campaign vs. an email blast promotion. After you discuss where they’ll be used, ask them for how long they’d like to purchase the rights to the photos. I usually provide 1-year, 5-year and full buyout options. Most companies assume they want a full buyout, but in reality they probably won’t be using the same photos in 5 years anyway. However if they want it for say a 6th year, they can renegotiate with you at that time. fotoQuote and BlinkBid are good programs for getting some estimated numbers for usage fees. It probably errs on the high side, but it’s a good starting point if you have no idea what to charge! Be sure to list out and charge for everything! If you’re involved in model casting, charge for it! If you’ve been asked to location scout, charge for that, too! You may want to consider using higher-end estimates so that you have room to negotiate and cover additional expenses that may come up at the last minute. It’s never a bad thing to come in under budget! When thinking about budget, I usually try to get an estimate from the client up front. That way I know what I have to work with. Sometimes it’s not appropriate to ask, so use your best judgement. Also, consider the type of client it is. Is it a start-up company or a well-established brand? Just know there is not always a correct set amount to charge, because every project is different. Ask your photo community what they think, and realize that at some level writing a photography proposal is more of an art than a science. Lastly when presenting a finished estimate to a client, make sure it has an organized look and feel on a branded document. If they ask, explain your fees with confidence, educate them on how costs are broken down and how you are worth every penny! Here’s an example of what my project estimate looks like. Kelsey was born and raised in Dallas. She received her B.F.A. in photography at the University of North Texas, and afterwards moved to New York City. She was named one of “Adorama’s ones to watch” in 2008, and also participated in several group shows. Recently relocating back to Texas, she continues to shoot for editorial and commercial clients by splitting her time between NYC and Dallas. Her portrait work can be seen on PinholePress.com and on her website. In addition to photography, Kelsey also loves snow, traveling, and playing her banjo.